Already own a home in the Stone Creek subdivision? Thinking of selling? Click here and read about current search trends & our web network. 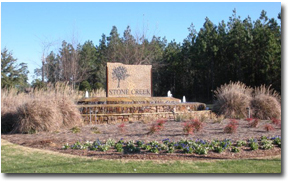 Stone Creek is a brand new village concept subdivision and is Fairhope, Alabama's first on the Eastern Shore. The subdivision is located off Highway 181. The subdivision comprises 330 acres of prime Fairhope real estate and is one of the most attractive subdivisions in town. The developers of Stone Creek created a perfect setting for the home of your dreams. In a natural and relaxing environment, you'll enjoy three lakes, large waterfalls built around the lakes, and at the entrance, lush landscaping and a lodge/clubhouse that overlooks a pool and fish-stocked lake and expansive wetland preserve. All the amenities in addition to the lifestyle carefully created in harmony with nature make Stone Creek an exceptional place to live. If you need further info, have questions or would like to schedule a viewing for any of the homes for sale in Stone Creek or any other properties in the area, please email info@condoinvestment.com or call (251) Area-Pro (251-273-2776) for immediate assistance.